I was born in Toronto and grew up in the UK. All four grandparents were actors and since my father was an actor as well, it was probably inevitable I would follow the bloodline. I have acted all over the world and appeared on stages ranging from London’s West End to Hollywood’s Twentieth Century Fox. Favorite roles have included Hamlet, Caleb the Gladiator in NBC’s Biblical-Roman epic mini-series, ‘AD - Anno Domini’, Clive Parnell in ‘Coronation Street’, and Jack Absolute in Sheridan’s ‘The Rivals’. I have written eight historical novels. The first, ‘The French Executioner’ told the tale of the man who killed Anne Boleyn, was runner up for the CWA Steel Dagger for Thrillers 2002, and has been optioned for the screen. Its sequel was ‘Blood Ties’. Having played Jack Absolute, I stole the character and have written three books on this ‘007 of the 1770’s’ - ‘Jack Absolute’, ‘The Blooding of Jack Absolute’ and ‘Absolute Honour’- short listed for the 2007 Evergreen Prize by the Ontario Library Association, all currently being re-released in the US by Sourcebooks. My novel about the real Dracula, ‘Vlad, The Last Confession’ was a bestseller in Canada and my novel, ‘A Place Called Armageddon’ was recently published in Turkish. All have been published in the UK, Canada, the US and many have been translated in various languages including Russian, Italian, German, Greek, Spanish, Portuguese, Czech, Serbian, Turkish and Indonesian. I have also written a trilogy for young adults ‘The Runestone Saga’. ‘The Fetch’, ‘Vendetta’ and ‘Possession’. They are also published in Russia, Greece, Turkey and Indonesia. My latest Young Adult novel ‘The Hunt of the Unicorn’ was released by Knopf in North America in March 2011 and also published in Spain. It was runner up for the ‘M’ Awards for Fiction, Victoria, Canada. My latest adult novel is ‘Shakespeare’s Rebel’, about William Shakespeare’s fight choreographer at the time of ‘Hamlet’, released in Canada and the UK in June 2013. I have recently signed to write two books for Century in the UK and Doubleday in Canada. ‘Plague’ and ‘Fire’ are tales of religious fundamentalist serial killers set against the wild events of 1665 to 1666, London. They will be published in 2014 and 2015. I live on Salt Spring Island, BC, Canada, with his wife and young son. 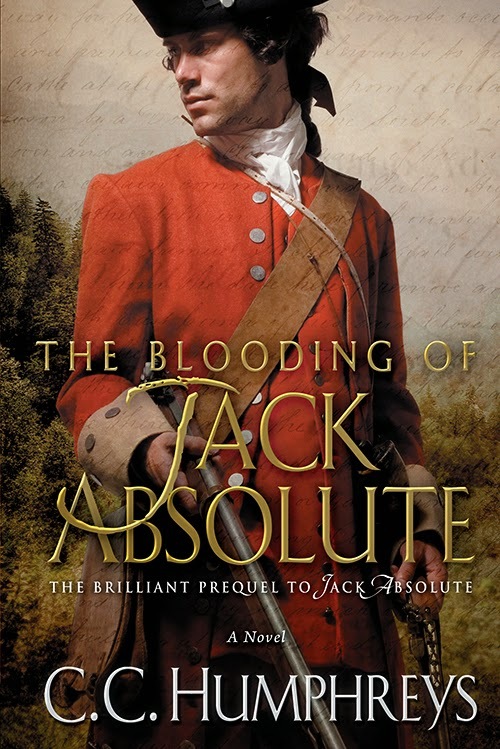 2—Your historical fiction novel, The Blooding of Jack Absolute, is out now—congrats! Could you tell us about it? Though it is the second ‘Jack’ I wrote, it is the first chronologically. I really wanted to take Jack from his childhood through his teen years to manhood. I also wanted to tell the extraordinary tale of the Battle of Quebec in the French and Indian Wars. That happens in the second half. The first is, really, my love letter to the London I grew up in – Soho and Covent Garden. There was a bit of drinking involved! 3—While reading your Jack Absolute series, the reader can definitely see a connection between author and subject. What was it like taking the character of Jack from the stage to the page? Wonderful! I got to relive a role I loved playing and then expand upon him. My wife calls him my fantasy alter ego. He gets to do all the fun stuff! Dangerous too, so I don’t envy him having to kill, or be a slave for a while, as he does in this book. 4—What can readers expect next in your Jack Absolute series? As many know, ‘Jack Absolute’ is a character in Sheridan’s ‘The Rivals’. My idea was that the playwright stole Jack’s name and based his play on an episode from Jack’s youth. In the play it is made into a comedy. I wanted Jack to set the record straight. Hence the next novel in the series, ‘Absolute Honour’ out in the US next Spring. It starts as a bit of a comedy but does end… not well! 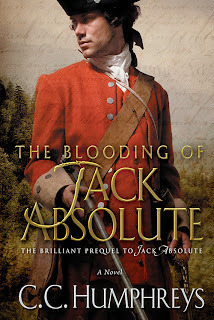 5—Why should readers read The Blooding of Jack Absolute? I hope it’s fun, funny, thrilling. There are some quite serious passages – war is serious – but also some lighthearted ones. And it has my favourite ever chapter title, after Jack and Ate kill a bear to survive the winter in the forest: ‘A Dozen Things To Do With A Dead Bear’. 6— What inspired you to become an author? The desire to tell my own stories after years as an actor telling other people’s. I’ve also always had a very vivid imagination and needed to get some thoughts down. 7—Is there a book that you’ve always wanted to write but been a bit hesitant? I think I need to write my father and mother’s story. He was a Battle of Britain Pilot, she was a Norwegian spy! But to write about one’s own family? It would be tricky. The Blooding of Jack Absolute: A Novel (ISBN: 9781402282249; NOVEMBER 5, 2013; $14.99 U.S.; Historical Fiction; Trade Paper). The novel takes readers on a journey back in time through Jack Absolute’s youth in the home of his drunk and wicked uncle Duncan, and his equally wicked cousin Caster, to his escape to London. Jack’s bright future is shattered during a night of revelry when his past and present collide and force him to flee England and find his fate in the dangerous New World during the ruthless French and Indian War. Amid hostile Indians, fierce colonial rivalries, and a brutal North American winter, Jack struggles for survival. But to survive, Jack must be blooded for life. He must learn to kill.